Over the past five years, the phrase "college and career readiness" has been used often by state and local policymakers, education foundations and non-profits, journalists, and, most recently, by President Obama, U.S. Secretary of Education Arne Duncan, and the U.S. Department of Education. The goal of preparing all students for college, careers and life has become the driving force behind many education reform strategies at the local, state and national level. It is increasingly clear that the college-and career-ready agenda has taken hold across the country. While policy and thought leaders in state capitols and Washington D.C. have embraced the agenda, it has always been less clear what the public thinks about the goal of graduating all students ready for college and careers and the specific policies necessary to achieve that goal, including college- and career-ready standards and rigorous graduation requirements. While states have made impressive progress on adopting and implementing college- and career-ready policies (see Achieve's annual 50-state report for state-specific progress), state and local leaders understand that the progress will only continue if the policies — and the rationale behind raising expectations for all students — have strong public support. This is especially true in a year with 37 gubernatorial elections; the sustainability of college- and career-ready reforms cannot be taken for granted. * 89% of voters agree that "to really get ahead in life a person needs at least some education beyond high school, whether that means university, community college, technical or vocational school." 89% of Republicans, 90% of Democrats and 87% of Independents agree with this statement. * 86% of voters support "college- and career-ready" graduation requirements, including over 80% of Republican, Democratic, Independent, rural, urban, suburban, White, Black and/or Hispanic voters. Be Bold: An overwhelming number of voters agree that college- and career-ready policies are the right approach for preparing our nation's students. Leaders shouldn't shy away from discussing these policies' importance and how they fit into the reform agenda. Instead, leaders should recognize this as an opportunity to engage the public more fully about college- and career-ready reforms and find ways to ensure there is ownership over the agenda at the state and local level, and across party lines. Acknowledge that Times Have Changed: The public clearly gets the link between education and both individual students', and our nation's, ability to compete in a global economy. There is widespread understanding that a high school diploma is no longer enough and that students will need to be prepared for education and training after high school to be successful in life. In an election year where "jobs, jobs, jobs" is the mantra, being explicit about the link between college and career readiness and economic success (both personally, as a state and country) is something voters understand. Be Upfront about How You Are Supporting Students: One area where voters were divided was around whether college- and career-ready expectations would increase the dropout rate, with voters split in half on this issue. Still, this concern did not sway voters away from their overwhelming belief that college- and career-ready graduation requirements were the right thing for all students. Rather, it suggests that states, districts and schools need to be aware of the valid concern that some students will need additional support as expectations are increased, and be prepared to respond to it. Talking about the specific policies, programs and initiatives in place to support struggling students as part of the broader college- and career-ready agenda will only increase the public's comfort level and support. 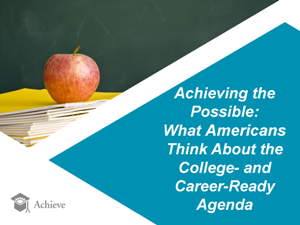 Bottom line: Policymakers and advocates who support the college and career-ready agenda do so with widespread public support — and policymakers should press for change knowing that they are on the right track. To view the survey results (either in Power Point or report form) see, www.achieve.org/AchievingthePossible.